I must admit that I haven’t heard of Twinings green tea several months ago. But as a green tea lover, it didn’t take too long before I came across, giving that it’s a very popular brand of green tea. This Twinings green tea consists of natural ingredients and is made by Twinings, a company with a long history in the industry. If you’re a green tea enthusiast like me, you’ll surely like this brand as it comes in different blends, including jasmine, naturally decaffeinated, lemon, and pure green tea. It is specially made from Camellia Sinensis, a plant that contains antioxidants and polyphenols, which comes with many benefits for your health. If you are looking to stock up your tea collection, here is a detailed review of the Twinings of London Pure Green Tea. 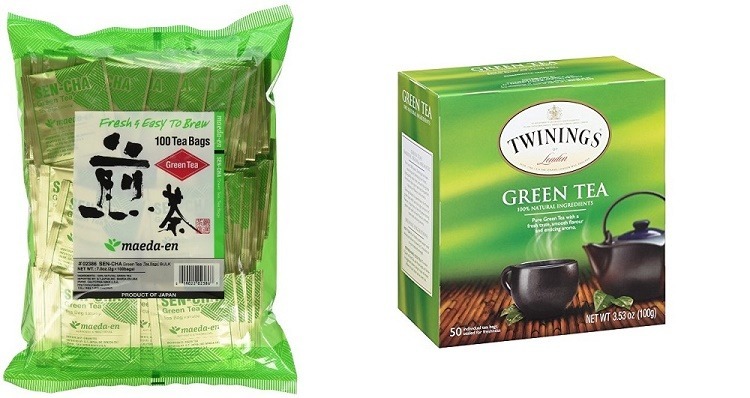 A package of the Twinings London Pure Green tea comes with six boxes of 50 green tea bags. Each bag is a mixture of enticing aroma and smooth flavor that can easily stick to the memory and a fresh taste that keeps the taste buds asking for more. To get your perfect cup of tea, all you have to do is steep in two minutes. Even if you are busy, you can still prepare your favorite cup of tea without leaving what you are doing. This green tea is produced with the greatest attention to detail. Before each bag is produced, the journey starts right from choosing only the highest quality leaves. First, Twinings ensures that growers follow their high-quality standards when planting the leaves while the blenders source only the finest leaves from the well-cultivated gardens. The result is a hand-picked, clean collection of leaves that are made into the green tea. All this is done to give you the best of your green tea experience. Not only that, the tea is blended to perfection to remove any sort of acidic, bitter flavor. The result is a tea that tastes nice with an attractive scent. Is the Twinings Sencha Green Tea Really Worth it? Definitely! There are high-quality teas and not so high-quality teas, and this one is surely high quality. There are thousands of reviews on this brand alone, with the majority being glowing and positive reviews. Even though there are many other green teas out there, the special care taken to produce this makes it worth more than others in the same category. Sometimes, you don’t know how good something tastes until you try it. With many experienced green tea lovers vying for this, it sure must be a great tea. You don’t have to take my word for it. What do buyers have to say about Sencha green tea? As mentioned elsewhere in this review, there are already thousands of reviews on the Twinings green tea with the majority being positive. This shows that a lot of people are satisfied with their purchase. Many buyers love the taste of this tea, although there are some buyers who didn’t think this is authentic Japanese tea. I can’t tell you how much you should love this green tea until you’ve tried it out yourself. The tea has won many in the past and the same awaits you. You just have to try it out to see. Is Twinings Green Tea Good for You? One of the advantages of purchasing the Twining Green Tea is that the tea bags are individually wrapped. This ensures that there is little to no waste. Moreover, this sort of wrapping keeps them fresh and once you open it up, the aroma is intoxicating, thus keeping you more interested. The individual wrapping is also great for you if you travel a lot as you’ll be able to take them everywhere you’re going. Another advantage is that you can select multiple sizes and flavor of the Twinings Pure Tea so you can have just what your heart desires. You also can search specifically for Twinings green tea Jasmine or the other flavors if you want to purchase a specific blend. The same way you search for other blends is the same way you search for the twinings green tea jasmine review. They are just different blends from the same company. Is there any Info on Sencha Green tea review? Yes! There is good information on the Sencha Green Tea. Some of the blends are from Japan and it is the same thing as the Twinings Green tea. The reason why it’s called Sencha is that it is mild and smooth, pure and natural, with a refreshing taste. If you are looking for the Sencha green tea review, then you are already on the right page. It’s a great option for an afternoon or early evening tea. Aside from the fact that it comes with foil packs that makes every cup fresh, you’ll almost always enjoy the flavor. Whether you are looking for a morning drink or an afternoon tea, the Twinings Green Tea will serve you just right. Moreover, the bag the tea is stored in tears easily, so you can conveniently have your favorite tea, any time you want. Great for migraine. If you suffer from nausea w/migraine, sending a few signals up there with a few caffeine is the way to solve it. No bitter taste if you steep too long. Even if you forgot the pot on the cooker and you hit the tea too much, the taste will not turn bitter. What you’ll rather get is a strong cup of tea, compared to other brands out there. Flexible tea. If you are looking for a good tea to brew in cold water or room temp, this is it. Twinings green tea has many positive reviews from previous buyers and this is not without a reason. If you like to drink green tea every day and you are ready to pick and add the best to your stock, then check out the Twinings of London green tea. With the amazing natural aroma and great taste, this tea will be the new sidekick in the morning.